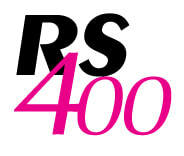 The RS400 is a classic, modern, one design class. It is fast, well mannered, beautifully built and attracts great sailors. With fully battened main and jib and an easy to use asymmetric spinnaker this double-handed hiking boat is fast, fun and highly tactical. It fills the growing demand for a non-trapeze boat with a spinnaker and broad crew weight range of, often mixed, teams (140kg to 180kg). Designed for ease of control, the interior layout is simple and efficient. The open transom allows the boat to largely self-drain after a capsize and the built in self bailer clears remaining water. Pivoting foils make life easy for launching and recovery. Nothing matches the balanced and responsive handling of the RS400 with its good manners in a big breeze and the excitement of racing with an asymmetric kite. Great sailing that delivers every time - in light winds and strong. Ready to race, complete with sails and trolley. Delivery charges apply, see price list.